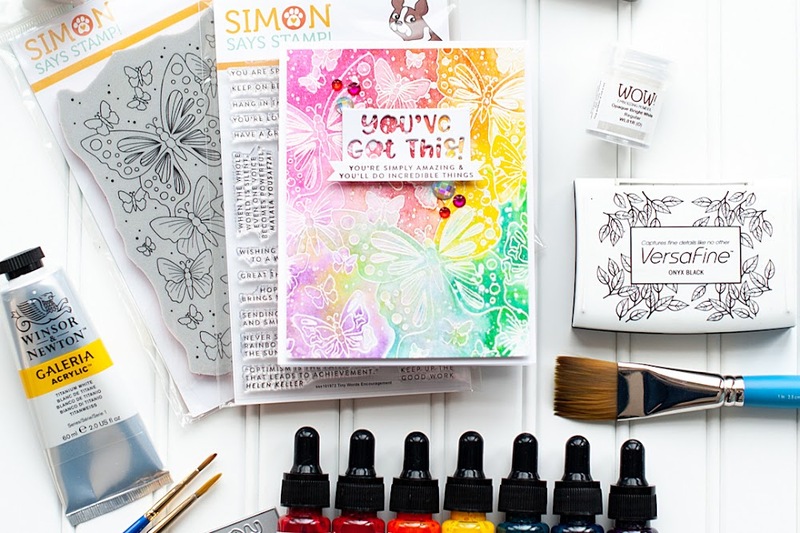 Today is my final WPlus9 inspiration day for April, and today I am sharing a gift set that I created with Mother's Day in mind...but it could really be used for anything! The jar has a homemade sugar scrub in it, and I will give you all the info on that at the end of the post. This would be great to give as is if you are on a tight budget, or with a gift card to local spa or for their fave skin care line! Any woman would love to receive that!! Here is the gift set! 1. Make A2 card from oatmeal cardstock, then ink the edges. 2. Cut wood paper slightly smaller, ink the edges & ahdere. 3. Cut a strip of grey paper, ink the edges & adhere down the middle. 4. Tie ribbon around the middle, then stitch a button around the bow with twine. 5. Add a doily to the front. 6. Cut a strip of butterfly paper, ink the edges and adhere over top of the doily bottom. 7. Diecut the tag, ink the edges & stamp the sentiment to it. 8. Adhere the tag, tucked slightly underneath it. 9. Stamp the canisters to oatmeal cardstock, cut out and adhere. 10. Accent the lower left corner with flowers to finish. 1. 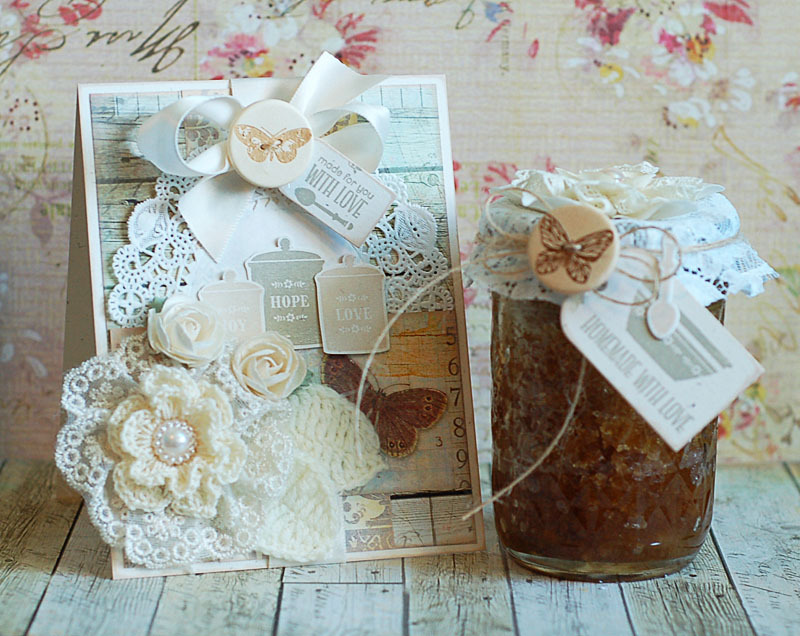 Cut a circle from a block of lace, then wrap around the top of the jar using natural twine. 2. Tie a double bow with the twine, then stitch a button around the middle. 3. Diecut the tag & spoon from oatmeal cardstock, then stamp them. 4. Adhere the spoon to the tag, then tuck the tag underneath the button as shown on the card. Alright...now onto the sugar scrub!! This is a homemade vanilla olive oil sugar scrub, and everything in the recipe I have readily available in the kitchen...which I am sure most people do!! So, there was no need to go out and purchase anything additional...which is really nice. No, it does not have a bunch of essential oils in it...so if that is important to you, then I would suggest finding another recipe online. There are HUNDREDS of them available!! I choose to do this less expensive version without the essential oils, because I use this scrub to exfoliate my legs before shaving. So, by the time I am done shaving....using essential oils & such would be a waste. But the olive oil stays, and keeps my legs nice & soft for the day! I do want to make a scrub sometime soon that is just for hands, and for that one...I will definitely go out and find some of my fave essential oils that are good for dry skin. Well, there you have it...my WPlus9 inspiration for the day! 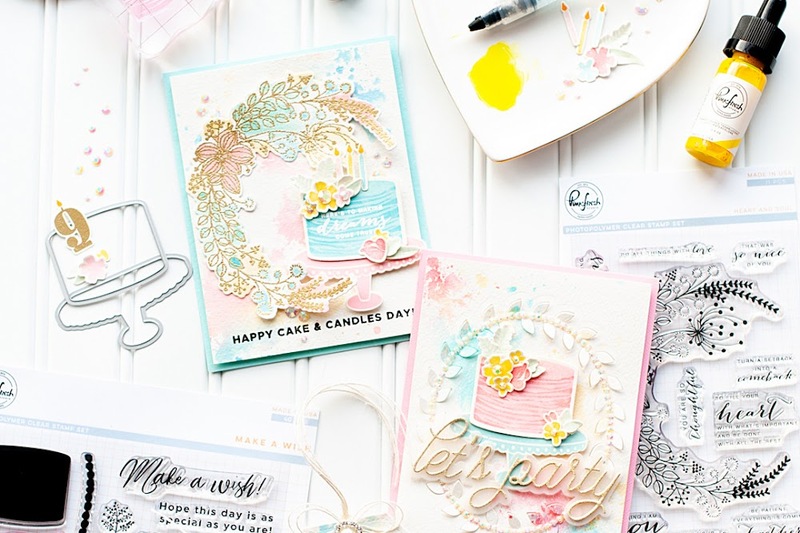 The WPlus9 designers have been sharing their creations all month long & it will continue on after my few days as well, so head on over to Dawn's Blog to check everything out! I hope that you have a fabulous Friday! OMG, this is strikingly beautiful!!! SO chic and elegant--LOVE those classy details like the flowers, the ribbon and the doily!! Just absolutely GORGEOUS!!! Beautiful beautiful card! I love the crochet leaves used. 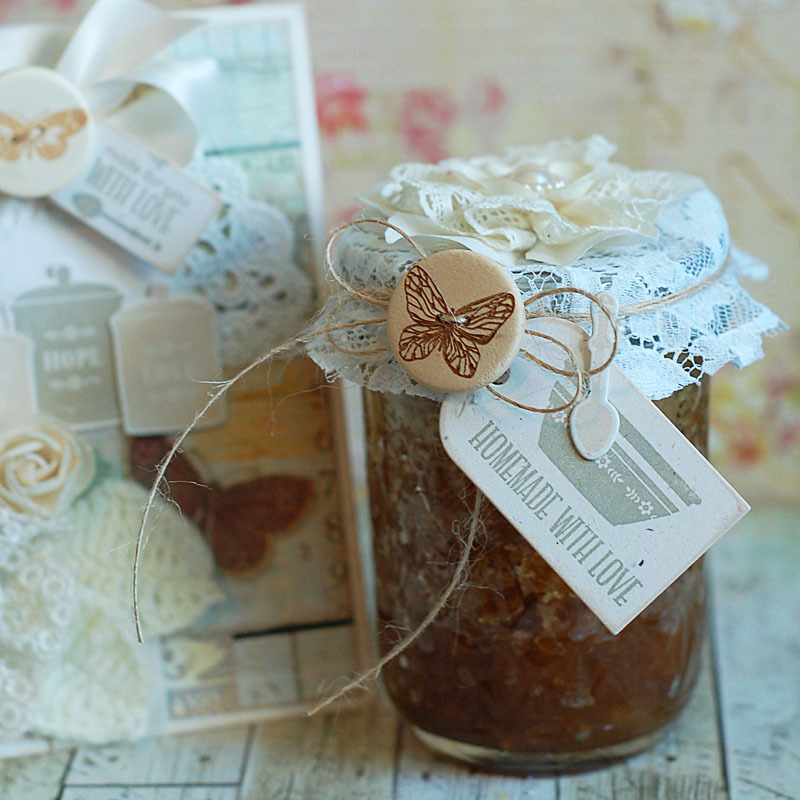 I may try the sugar scrub too and I love the packaging. So pretty, Lea! 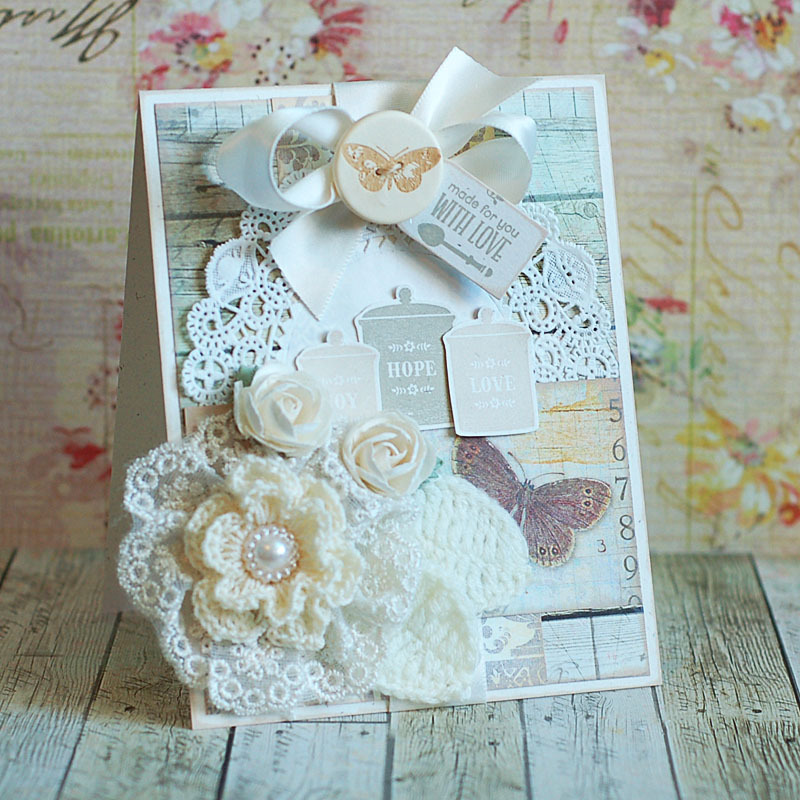 LOVE all the lace to bits, and the neutral palette is divine! WOW! Amazing card!! What a great gift! That card has so many layers and elements to it, it must have taken hours! I hope the receiver really appreciates it! Love your gift set Lea - that card is so pretty! The neutral shades and wonderful textures all layer up so beautifully, thanks for the inspiration! This is so beautiful. I love it great gift idea! 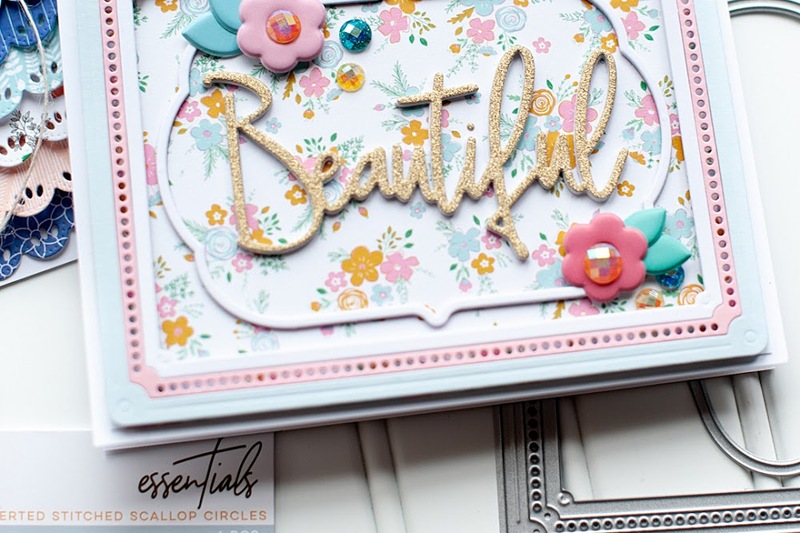 Do love your gorgeous card and beautifuld details.